Michel Montecrossa’s live-performance of ‘For All The Good Things’ and the Fire Dance of Al-Kimiya – recorded at the Spirit of Woodstock Festival 2012 in Mirapuri, Italy. The 22nd Spirit of Woodstock Festival 2014 in Mirapuri, Italy, from Friday 25th July till Sunday 3rd August 2014: 10 days of free music revolution with free entrance and friendly prices for camping, food, drinks and Hotel accommodation, together with the Mirapuri Rainbow Gathering and Mirapuri’s one and only original Bavarian Oktoberfest in Italy presenting open air concerts, hearty festival feastin’ and drinkin’, groovy festival-bazaar and international coming together. The new highlight for 2014 is the DreamSpace Electronica Fest at the Spirit of Woodstock Festival in Mirapuri, Italy which presents on Sunday, 27th July and Monday, 28th July the best of live Electronica dancing and raving. 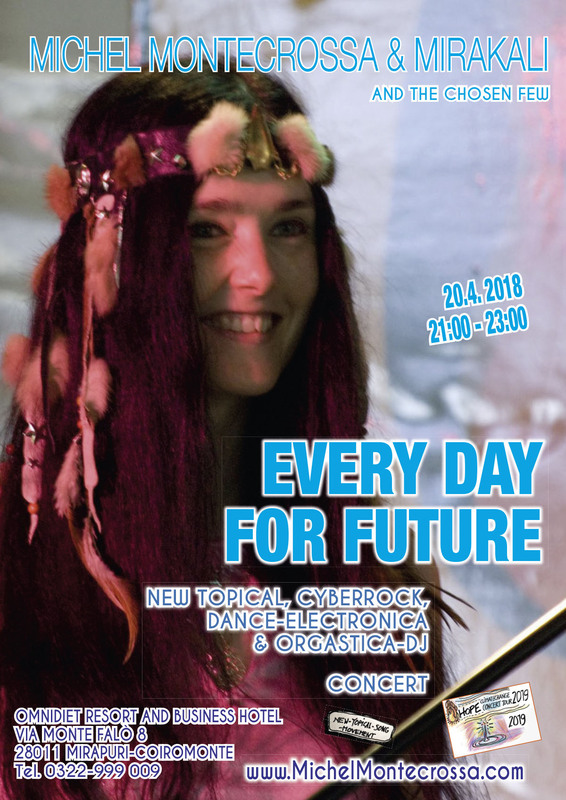 CyberRocker Michel Montecrossa (MichelMontecrossa.com) started the Spirit of Woodstock Festival in Mirapuri together with the DreamSpace Electronica Fest, the Mirapuri Rainbow Gathering and Mirapuri’s one and only original Bavarian Oktoberfest in Italy. Since its inception the Spirit of Woodstock Festival in Mirapuri together with the DreamSpace Electronica Fest, the Mirapuri Rainbow Gathering and Mirapuri’s one and only Bavarian Oktoberfest in Italy has developed into a great Free Music Event with free entrance, free camping, friendly prices for food, drinks and Hotel accommodation and with an international flair and inimitable atmosphere of Love and Joy. The Italian ‘Giornale Metropolitano’ published an article about Michel Montecrossa’s ongoing ‘INTENSITY’ Art Exhibition at the Mirapuri New Art Gallery as well as his upcoming ‘The Road Of Love & Sweetness’ Concert that he will play together with Mirakali, Diana Antara and The Chosen Few on 1st May 2014 from 22:00 – 24:00 in the Omnidiet Music-Hall (Via Monte Falo 8, 28011 Mirapuri-Coiromonte, Prov. di Novara). 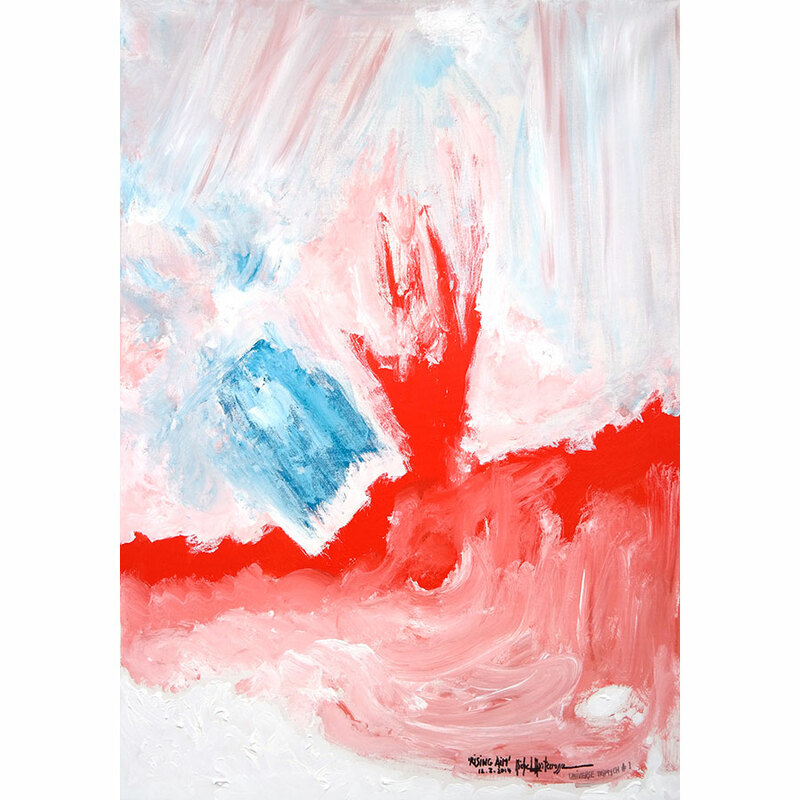 La mostra d’arte primaverile-estiva ‘INTENSITY’ di nuovi disegni e dipinti di Michel Montecrossa esposta nella Mirapuri New Art Gallery (presso l’Omnidiet Resort and Business Hotel ,Via Monte Falo 8, 28011 Mirapuri-Coiromonte, prov. di Novara) è stata aperta nel mese di aprile e resterà aperta fino al 24 ottobre 1945. 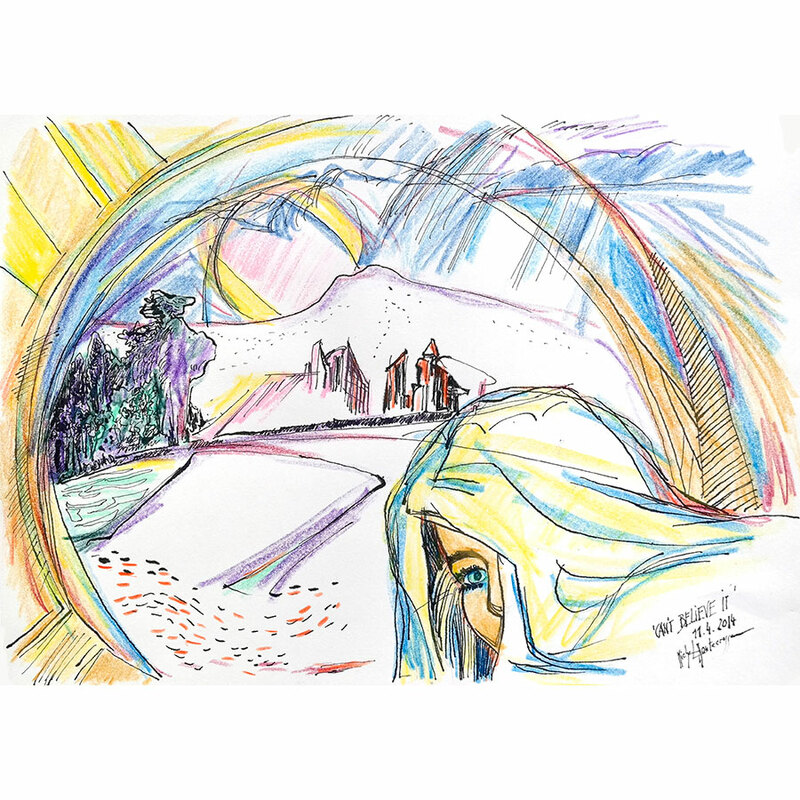 Tutti i dipinti e disegni di Michel Montecrossa sono disponibili sotto forma di una stampa artistica digitale in alta risoluzione su tela in formato originale del dipinto o disegno. 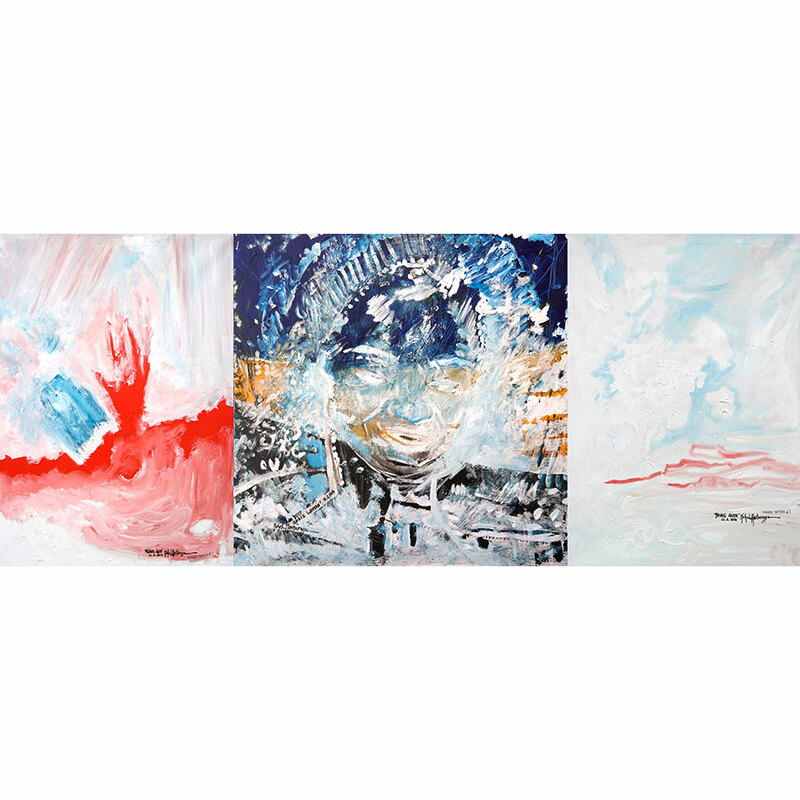 The ’Universe Triptych’ is a holistic composition of three expressive paintings depicting the unfoldment of the universe through the motive of the evolutionary will of consciousness as universal matter (the left painting of the Universe Triptych with the title ‘Rising Aim’), the motive of the action of conscious power driving and shaping the entire universe (the center painting of the Universe Triptych with the title ‘Deep Space Woman’) and the motive of the expansion of universal life and love with the universe as their home (the right painting of the Universe Triptych with the title ‘Young Alien’). The ’Universe Triptych’ is a melodious chord and a triple poem manifested through three paintings transmitting a threefold sensual stimulation of blue-red color power balanced by the magic atmosphere of gold-ocher and white hues of light providing the complex structure for carrying the three motives of a rising hand, a mystic woman and a young alien being transmitting the inwardness of a cosmic contemplation. The ’Universe Triptych’ thus is a free-mind exploration into cosmic consciousness and the wellness it gives. 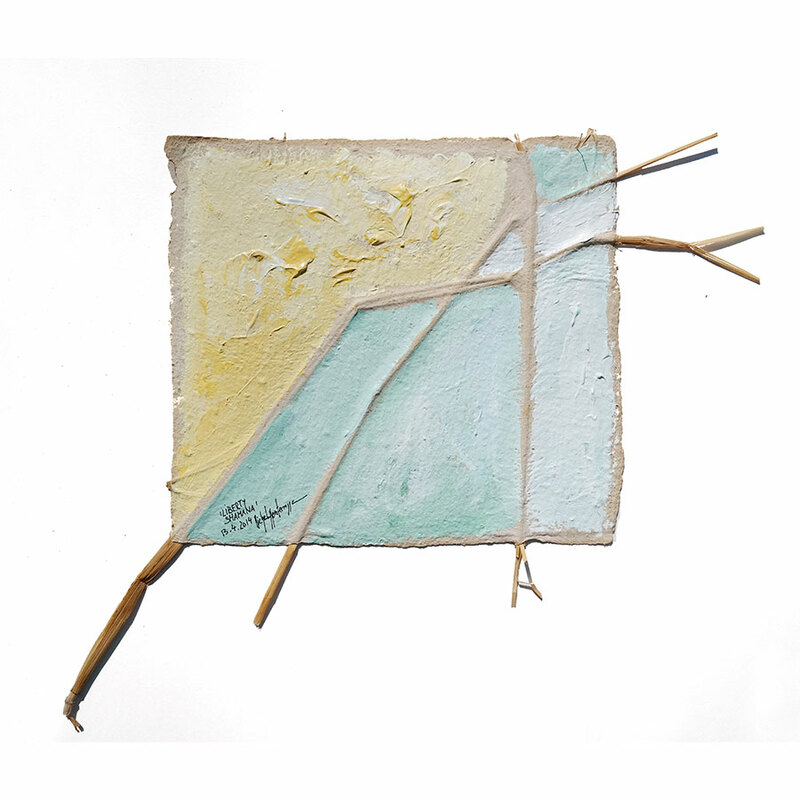 ’Young Alien’ is the right side painting of the Triptych, titled ‘Universe’. Delicately painted a young alien moves in the bright air of a distant planet. 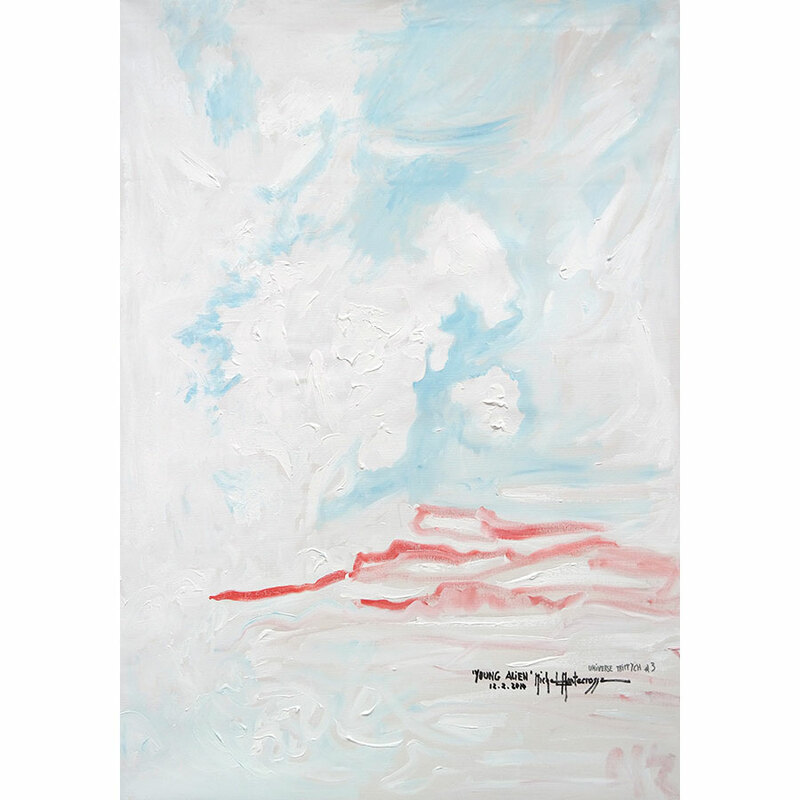 The light in light atmosphere of white andblueish white is rooted in a determined, empathic roseate ground structure leading into an intensely white shining expansion, contrasting the exquisite youthfulness of the sky. All these elements carry the young alien floating through the air and create the enchanting vibration of the affluent life energy that is the privilege of the young alien’s newborn body cells. 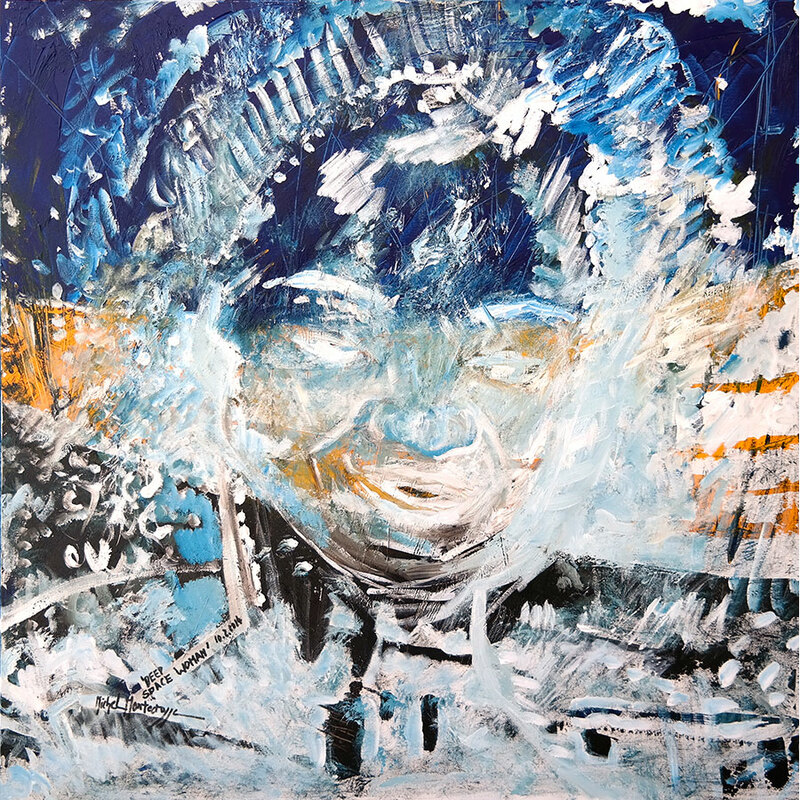 ’Deep Space Woman’ is the center painting of the Triptych, titled ‘Universe’. It brings to the front the stunning expressiveness of the universe imaged as the ‘Deep Space Woman’. The complex play of color ranges, color depths and emerging light is embedded in the multidimensionality of a composition which is both: direct talking and mysterious. The cosmic curtain of deep blue and the gold-ocher sunbelt stretch reach toward a metallic planet base as the stage for the appearance of the face of the Deep Space Woman, the female personality of the creative cosmic consciousness energy. The ’Deep Space Woman’ is an entrancing painting touching the innermost with its sublime and at the same time revealingly intimate atmosphere.